The Eruption of Mount Bromo East Java you should to know. 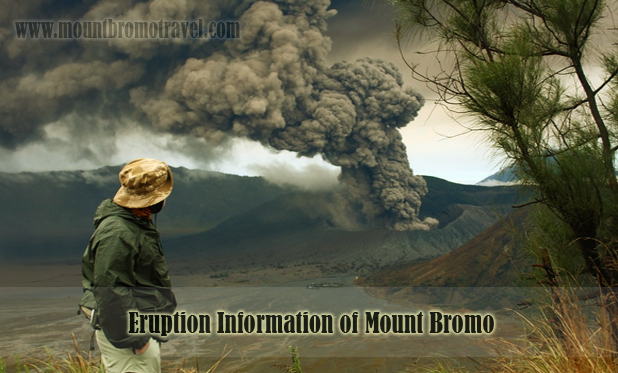 An Eruption Information of Mount Bromo something you may want to look up before planning a trip to Mount Bromo. Some people might heard about the legend of Mount Bromo where it erupted in the 15th century caused by the anger of the gods, but when are the eruptions happened that are actually recorded? Here is an Eruption Information of Mount Bromo ever recorded. The Mount Bromo eruption that happened in 1974 was the biggest eruption recorded in the 20th century. It directly affected area in the radius of six to ten kilometers. The sea of sand around the mountain, which contains of fine volcanic sand, is said to be formed by the impact of the eruption. The 2004 eruption happened on Tuesday, June 8th, 2004 at about 3:20 PM GMT +7 Jakarta time. Mount Bromo threw rocks and volcanic material along with thick dark smoke to the sky. Two tourists were found dead under pile of volcanic sand just under the edge of the crater. Five other tourists were reported to suffer injuries. Ashes and sands flew up to Probolinggo, and people in Malang were able to see the dark night sky the eruption had caused. Eruptive activities of Mount Bromo were recorded to happen between the late 2010 and early 2011. It threw up rocks and volcanic ash, affecting the area around Ngadirejo and Sukapura Wonokerto village in Probolinggo. People inhabited that area and another area surrounding it were warned about the potential of health problems and environmental damage. They were cautioned about yellowish sulfuric ash that emerged from the crater when eruption happened. The ash can cause respiration problems to anyone who inhales it. In 2016, there are several volcanic activities in Bromo. On January, there were eruptions and earthquakes recorded. The earthquakes recorded to last approximately for ten to thirteen seconds. Last volcanic activities were recorded on the last week of February. Less activities were seen from Mount Bromo. There were light thin white smoke from small eruption and slight sulfuric smell detected from the smoke. The danger area that was inside the 2.5km radius from eruption point is now reduced to 1km radius. That means that tourists are allowed to visit the mountain but they need to avoid the dangerous 1km radius from eruption point. Mount Bromo is after all an active volcano. Before you visit it, make sure you search for the conditions and safety precautions. It also helps to know the interval of every recorded eruption from an Eruption Information of Mount Bromo.